Wow! I have a dozen 12 inch bully sticks! 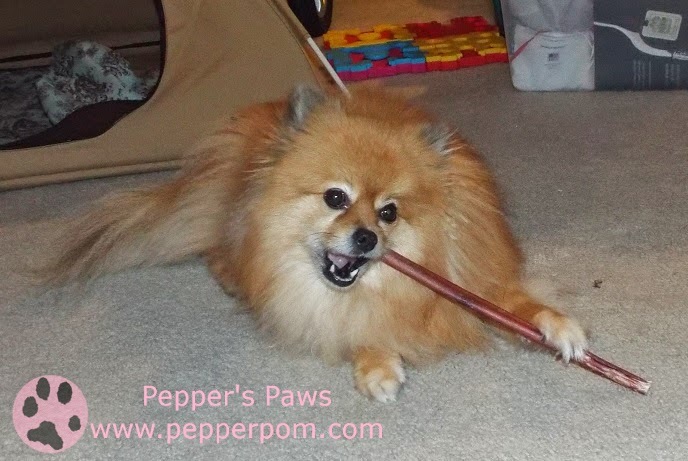 These are even better than regular bully sticks because these are odor free bully sticks from Best Bully Sticks! Yes, Odor free! Now your human can't throw away your favorite chew because they think it smells. BOL!! 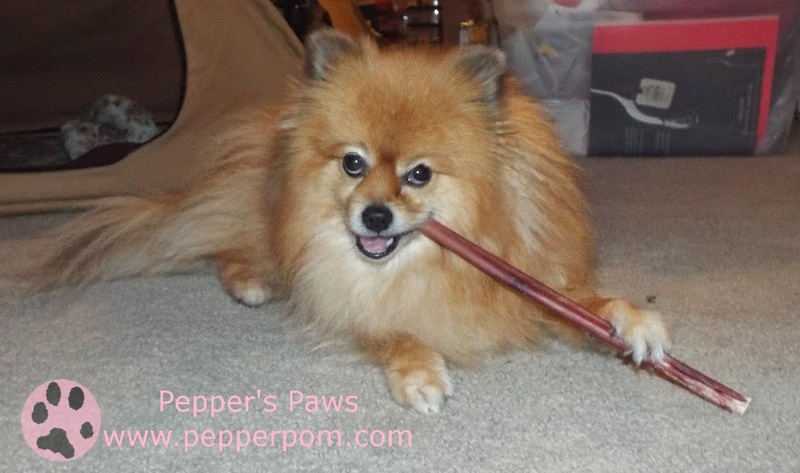 These bully sticks are made the all natural way without using toxic chemicals. Best Bully Sticks dries them longer than a standard bully stick is dried. Moisture is the primary cause of odor in bully sticks, so these extra dry bully sticks don't smell. Every chew from Best Bully Sticks is all natural. Best Bully Sticks are made from free range, grass fed cattle from either the USA or Brazil. The odor free ones are from free-range, grass fed Brazilian cattle. Best Bully Sticks are 100% beef, and USDA certified & inspected. Now that I've barked about the impawtant ingredient information for your humans, let's get down to the good part - taste & chewing! 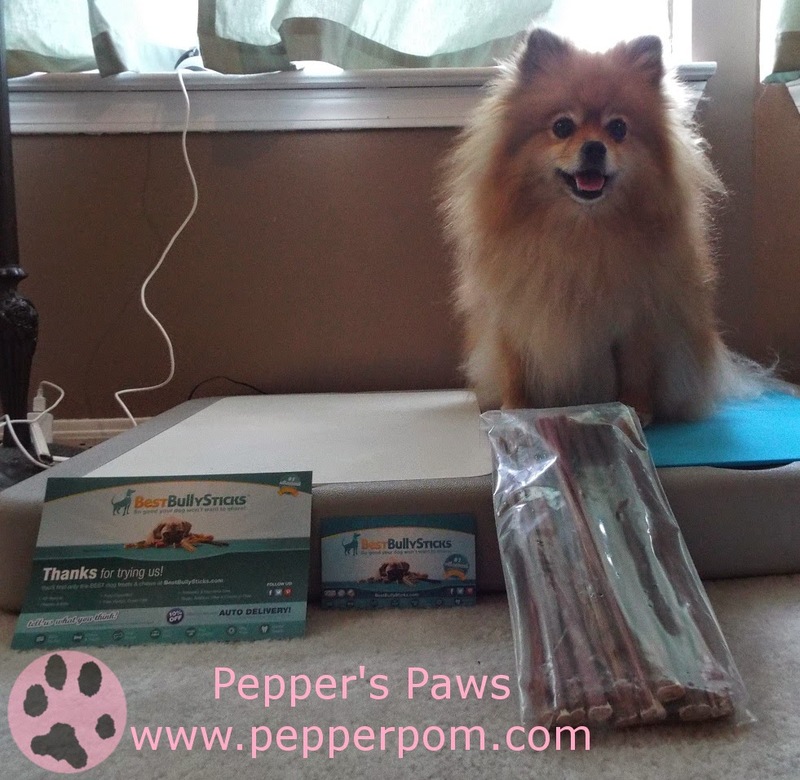 These odor free bully sticks are yummy and long lasting. I still have part of the one I was chewing in the photos. These bully sticks are 12 inches long. They will provide a nice chew session for big dogs, and they will last an extra long time for small dogs like me. All of this chewing will help keep my teeth and gums nice & healthy. 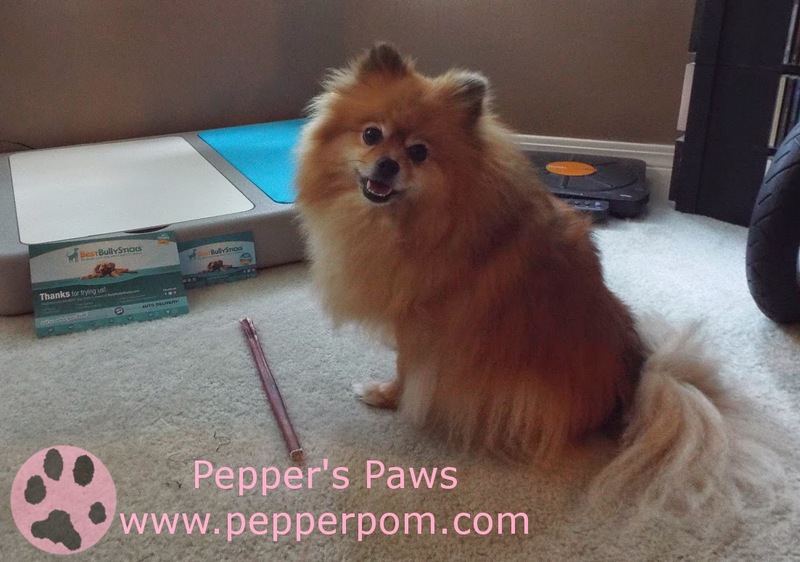 One Pepper's Paws fan will win a dozen 12 inch Best Bully Sticks! Giveaway Disclosure: I did not receive any compensation for this giveaway. Best Bully Sticks will ship the prize directly to the winner of the giveaway. I am not responsible for lost/missing prizes. The opinions in this giveaway are my own and not influenced by any outsider. These sound perfect for Bear & Scooter! i would need the 36 in ones. Bully sticks...a flavor I savor, Pepper. Ma doesn't care if they stink or not really but I bet she would be happy to have some around that have no odor. I may just have to give this giveaway a go! I've never tried bully sticks for my dogs. I have five Treeing Walker Coonhounds, weighing from just under 60 pounds to almost 80 pounds. I'm not sure what size they'd need, but I'd guess large? Knowing my dogs, they'd have them gone in just a few minutes. They are chew monsters! My dog likes the medium size bully stick. It takes him about 10-15 minutes. The 6'' or 12'' would both work. The 6'' is a smaller treat that last 5-10 and the 12'' are bigger and would last longer. My dog likes to hide his first so it can take awhile until he eats it. I say the stinkier the betters! Butts, we have to keep the peeps happy, right? I like the 12 inch sticks, but they only last about 5 minutes. I love them and mom likes that they are a healthy treat. We have some big chewers in our house and the 12" bully sticks are the best at keeping them busy :) They last 15 minutes with my big dogs and up to a 1/2 hr with my small dogs. 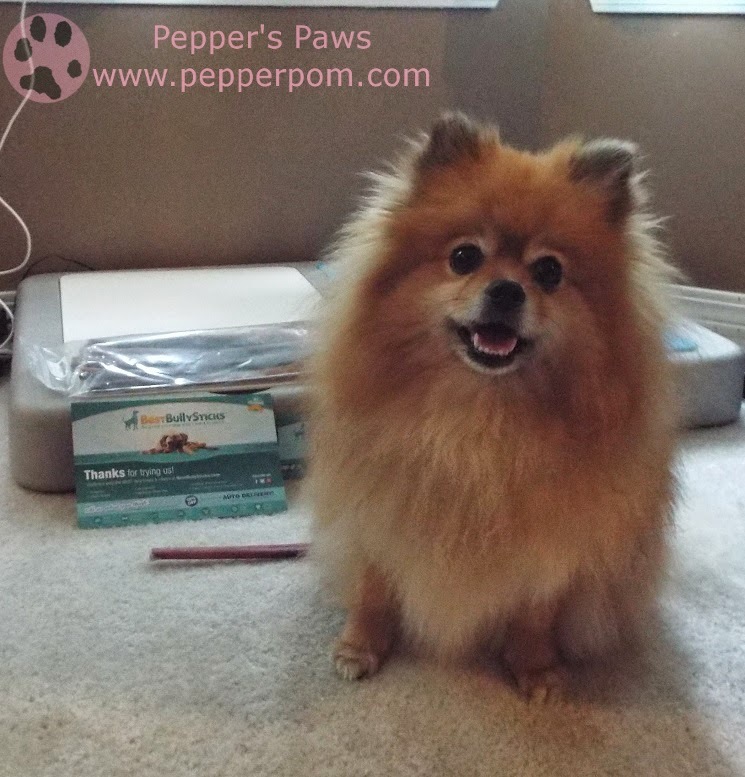 Woof, Pepper! I wonder how long a 12-inch bully would last me! I've only evfur had 6-inch ones. I would love to win! Stella has tried both the 6" and the 12". We prefer the 12" as they last approximately 30 minutes. Thanks so much! My dogs have never tried a bully stick. They do like raw hides and they chew them up in 10 minutes or so. We've actually never tried a bully stick yet but have been meaning to do so. I can't imagine it would last long though given how quickly she gets through her other snacks! The 12" ones last about 3 minutes! LOL. Our dogs are huge fans of bully sticks. They used to carry them in bulk at Costco and I would pick them up all the time. Next time I see them, I'll have to see how they're made and where they're sourced.